“What matters isn’t who votes; what matters is who counts the votes.” So spoke Joseph Stalin, and what was true in his bureaucratic dictatorship is apparently also true in capitalist America. In the run-up to the election, Sanders was within 2% of Clinton and gaining. This result probably underestimated the Sanders vote because the polls tend to be based on previous voters, and there were millions of newly registered voters, the great majority of whom were almost certainly Sanders supporters. Yet, what were the official results? Here are the notes a poll worker took during her training. At the bottom she noted the instruction to give NPP voters provisional ballots. These ballots are not counted. 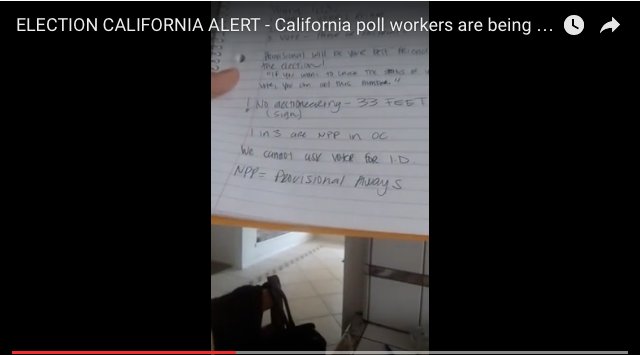 A poll worker in Southern California explains the disparity: California voters can register according to one of the parties on the ballot or as “no party preference” – NPP. The California Democratic Party allows NPP voters to vote in their primary if such voters wish, and as we know, Sanders tends to overwhelmingly win such voters in states where they can vote in the Democratic primary. In California, there are 4.2 million such voters.. That is more than the slightly under 3.5 million votes that Clinton and Sanders received combined. What happened to these voters? According to the Southern California poll worker, poll workers were told to give NPP voters a “provisional ballot.” In general, provisional ballots simply aren’t counted! This is just the most blatant of the methods used to evidently obtain a fraudulent result in the California Democratic presidential primary vote. This video may contains illusions in the entire system, but it also shows the system’s corruption. Our media – which is always bragging about how free it is – has completely covered up this fraud; they have breathed not a word. Not a word about the contradiction between the previous polls and the ultimate “result”. Slightly older voters might remember something that was totally lacking in these “elections” – exit polls. In past elections, the media did exit polls which almost always almost exactly mirrored the official results. This time there were none. When George Bush was fraudulently given the election in 2000, a major piece of evidence of the fraud in a number of states was the wide disparity between the official vote count and the exit polls. Nobody can say they haven’t learned from experience! A Hillary Clinton rally in Los Angeles (left) and a Sanders rally in L.A. (right). Can we really totally discount the size of the crowds as far as the election results? Left liberal Dennis Kucinich leaving Air Force One with President Obama in 2010. Obama was pressing Kucinich to drop his insistence on “single payer” and support “Obamacare” instead. With them was Congresswoman Marcia Fudge (D. Ohio) who supported Obamacare. Shortly after this plane ride, Kucinich did as Obama demanded. What should Sanders supporters expect from Sanders meeting with Obama except that he support Hillary Clinton? Haiti, her support for the coup in Honduras, etc. The reason for his silence is contained in what he’s said many times over: That his goal is to strengthen the Democratic Party. He is the loyal opposition (with emphasis on “loyal”) within that party and within the capitalist system that he represents. Instead, he will be going into a closed door meeting with Obama. What can anybody reasonably expect to come of that meeting?